Here's a sample recipe from the "Lunch" chapter of FROST BITE. These little tartlets are just the thing to serve up for a casual lunch, summer dinner or a picnic. They are happily eaten by both vegetarians and meat-eaters and are best served warm or hot, but would be quite all right to eat at room temperature if need be. Just don’t serve them fridge-cold as the chill will lessen the flavours. Preheat oven to 180°C (350°F), grease four individual pie tins. Cut a 17cm (7in.) circle from each sheet of pastry then ease into pie tins. Combine the remaining ingredients except cherry tomatoes in a large bowl and mix well to combine. 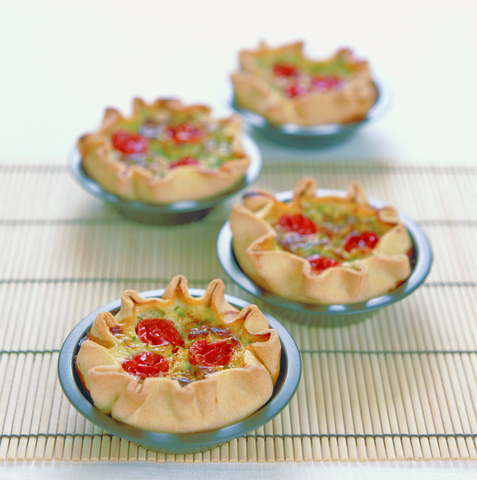 Spoon the zucchini mixture into the pie tins then place tomatoes on top of each tartlet, pressing them in slightly. Fold the overhanging pastry in towards the middle of the tartlets, gathering it a little as necessary. Place the tartlets on a tray and bake for 40-50 mins, or until the zucchini filling has set and browned a little, and the tomatoes are a little bit shrivelled. Remove from oven and allow to cool. Freeze: Place the cooled tartlets in a freezer bag or plastic container (with or without the tart tins) and place in the freezer. Reheat: Bake in 200°C (400°F) oven for about 20 mins, or until heated through. Serve: Great with a baby spinach, pine nut and currant salad.